We specialize in making belts for a wide variety of industries: Healthcare, food and beverage, and hospitality Laundries; paper converters; airlines; bakeries; confectioners; supermarkets and others. For the laundry industry, our belts are found on every type of ironer, folder, Spreader/feeder, stacker, picker, soil sorter and clean takeaway lines. We have the most complete inventory of domestic and imported beltings, which enable us to turn around our customer's orders quickly. 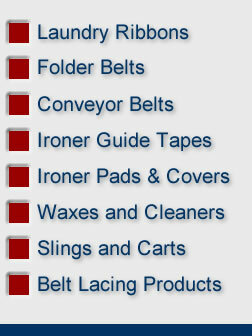 The right belts/right material/right sizes/right prices/right away! In addition to belts, we offer hundreds of laundry customers dozens of items they use everyday to process linens and other flatwork items. In fact, we helped our customers clean and finish over 1 billion pounds of goods in 2010 and saved them a ton of money in the process! Our customers are capable of installing our belts and other related items with their own in-house personnel. Their savings are substantial when compared to using an outside vendor to do the installation. Our company began as a textile weaving operation and given our focus on belting for over 60 years, we have a high level of expertise and know what works best. We offer many identical o.e.m. beltings found on new machines. Our close relationship with our raw material suppliers has enabled us to lessen the effect of sharp rises in the worldwide prices of cotton, polyester, aramid and other raw materials. We use this competitive edge to give our customers a competitive edge. Ask for our free one of a kind product catalog.